Characterised by their thin metal frames and kaleidoscopic reflective lenses, aviators were originally developed for pilots to protect her eyes while flying. Arguably one of the first style of sunglasses to become popularised, they transformed from a piece of military equipment to a commercialised fashion item after Ray-Ban created the original aviator in 1937. Fast forward to today, and almost every designer features this style of lens. 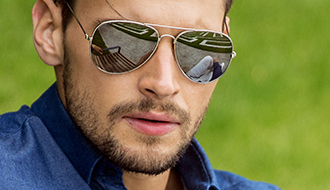 Aviator sunglasses are light in weight and feature a double or triple bridge, as well as flexible temples that sit perfectly behind the ears. Timeless and versatile, they are mostly three times bigger than the eye socket for maximum protection against UV rays.